What if I told you that you could do 80% less work, spend 80% less to rank your keywords, and actually generate exponentially higher revenue? If you’re doing keyword research for new sites and you're not applying the 80/20 principle, you're missing an opportunity to potentially 10X your business while doing less work and spending less money. 20% of your actions, inputs, or products or services will create 80% of what you want. ﻿Note: A more flexible way of expressing this principle is that a small % of your input will create an exponential % of your output i.e. a power law. In my experience, SEO often follows the 80/20 distribution as well. 20% of the keyword groups you target (I say groups, because ranking for a shorttail keyword means you rank for many of its longtails as well) will often result in 80% of your results. 20% of your pages often generate 80% of your site's revenue. And 20% of your projects often generate 80% of your income. Doing accurate and comprehensive keyword research is easily the biggest leverage point in all of SEO. I'd rather target a great keyword that converts well and I can rank for effortlessly, than be given a bunch of high authority links from CNN, Forbes, BusinessInsider etc., but be forced to optimize for a horrible keyword that's hard to rank for, has little traffic, and doesn't convert. In this post, I'm going to show you how I use the 80/20 framework to laser target profitable keywords right from the start of a project, so I can minimize the resources wasted on the 80% of keywords that will end up generating little to no revenue. A couple years ago, I did a ﻿case study on Lifed.com﻿, which sold for $205,000 on Flippa. What was really interesting about the sale was that even though the site had 125 published articles at the time of sale, the vast majority of the traffic - both organic and social - was coming from just 2 articles. 2 / 125 articles accounted for the vast majority of the site’s traffic, which means 1.6% of the input generated 80-90% of the output! You’ll see there were 13381 pages that received traffic, but a large % of these pages are auto-generated pages that pull from a stats database and many of them are no-indexed. I won't count them in our 80/20 analysis since the cost to create those additional pages was negligible. In total, about 300 of the pages have actual unique content on them. .33% of the pages generated 17% of the revenue. 3.33% of the pages generated 40% of the revenue. Not an exact 80/20 distribution, but pretty close. Its safe to say there's a power law in effect here: a small % of the input resulted in an exponential % of the results. If you check your own sites, you’ll frequently see that a small % of keyword groups end up driving the majority of your traffic and earnings. The question then is: how do we take advantage of this so we can generate more revenue using fewer resources? What’s a practical way to implement the 80/20 rule in your SEO campaigns to get more bang for your buck? At this point, you might be wondering why my keyword research process looks different than the one Hayden teaches here. Hayden's method uses the same 80/20 principles to identify low hanging keywords that will be profitable and that you are likely to rank for. Hayden's keyword research method can make very specific predictions because it makes certain assumptions about the type of site you're building (small niche sites with a PMD domain) and the strength of the PBN network you're using to rank the site. If you're building a really tightly focused niche site, you want to be especially precise in selecting your keywords - if the main keywords you choose aren't profitable or you can't rank for them, you won't make any money. If you're building small niche sites, the Thirst method taught here is a great framework for identifying low hanging fruit. The method I'm sharing here is a looser framework which helps you cast a wider net with the goal of building a broader site that can be grown into a niche-dominating authority site. You can follow it step by step, or just pick and choose the tactics you like and apply the overall framework to launch your next project more efficiently. If you're building broader sites, then you do have more room for error on a micro level (e.g. picking individual keywords) since anything you do that increases your overall domain authority will increase your ability to rank for more difficult keywords down the road. Focusing less on the micro-details lets you focus on other aspects of site building like user experience and content quality, which can pay off in very important but less quantifiable ways - like making it easier to generate "earned" links, getting social shares, email opt-ins, increasing asset valuation, and creating more SERP stability. Even though these types of sites aren't as focused on ranking for a handful of "main" keywords that will make or break the site's success, targeting high ROI keywords as early as possible is still mission critical. You can learn a bit more about my overall approach to building web properties here. I will be following up over the next few weeks with articles touching on other aspects of my process as well. Understanding what you’re optimizing for is extremely important. I’ll go ahead and assume your end goal is to make money, not simply to simply to rank #1 in Google as a vanity metric. In either case you're really optimizing for revenue, but if your business model revolves around selling CPM ads, then more traffic = revenue. If we're optimizing for traffic and our goal is simply to prioritize our keywords, we can usually ignore SERP CTR at this stage, and simply look at volume. For all other businesses, you should optimize for revenue potential. This means not just looking at search volume, but your visitor values as well. Since we're launching a site and don't have this data yet, we can look at CPC and Advertiser Competition as proxies for visitor value. The first 3 metrics are what we will use to project a keyword's revenue potential relative to other keywords. This lets us identify the low hanging fruit. Note: Those metrics aren't enough to project how much the keyword would potentially earn - to do that you need to factor in SERP CTR and Ad CTR (if you're running display ads) or conversion rate if you're selling a product. If you really want to get laser targeted, you would also factor in your Highest Attainable Rank based on your keyword difficulty analysis, but we're not going to dive into any of that in this article in the interests of keeping things simple. Keep in mind there may be intangible reasons to target high volume keywords w/ low revenue potential. Low commercial intent keywords can be used to create useful informational content that solves user problems. 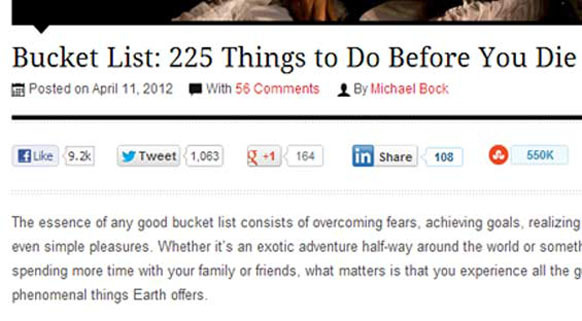 This type of resource content is often useful as a target for "earned" links and social shares. In some niches, they also help add balance to your site so it isn't just a spammy affiliate site targeting only commercial "buying" keywords. Users searching for informational keywords may be higher in the sales funnel than someone searching for high commercial intent keywords, but if you capture their information (the content upgrade method is great for this) you can convert a certain % of them into buyers or readers as well. Optimizing your funnel will increase the ROI of everything you do. Applying the 80/20 rule, I want to find the high volume/high profit keywords that will give me the most return for my minimal backlinking efforts. I’ve found the simplest way to do this is to reverse engineer what other sites in the niche are doing. What keywords are the authority sites ranking for in this niche? More importantly, what keywords are the lower authority sites ranking well for in this niche? Using this method to gather keywords will also give you keyword ideas you don't always get via Google Keyword Planner. 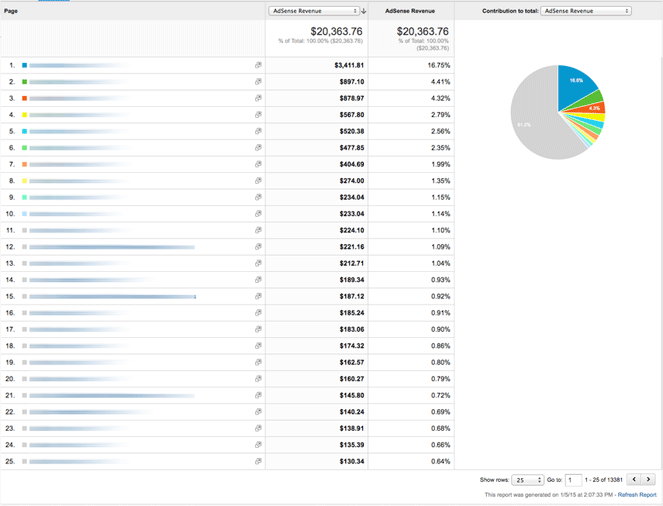 Using this data, it’s pretty easy to reverse engineer the highest traffic/highest revenue potential keywords. Additionally, by analyzing what smaller, lower authority sites are ranking for, it’s easy to pick out the low competition/high value keywords. Use the Alexa toolbar/SEOQuake plugin for this exercise, the combined stats let you quickly scan the SERPs and see if a site actually has authority/traffic. If it does, you can quickly plug it into SEMRush. With Google, we'll find sites in our niche that are already ranking for popular keywords, and we'll create a seedlist of about 4-7 authority sites in the niche, as well as 4-7 smaller sites that look like affiliate/niche sites (if applicable). We'll then run each site through SEMRush one by one. For each seed site you run through SEMRush, filter out all keywords that don’t meet your minimum requirements. These requirements will vary based on your goals, the type of site you're building, and your ability to rank. Optimizing for traffic: Filter out anything w/ 2000 or less volume. This can be higher or lower depending on your niche/ranking ability/revenue goals. Optimizing for revenue: This depends completely on your niche, but if you're doing typical affiliate stuff, its usually safe to filter out anything with less than 200-300 search volume at this stage. However, if you have a high value product (e.g. lead generation referrals to local personal injury lawyers) you may want to adjust. You can add filters to remove keywords with low CPC and Advertiser Competition. Sort "descending" based on Search Volume. Do a quick eyeball check and delete (or tag) the keywords you'll obviously never try to rank for - usually the ultra high volume, single word "head" keywords. So far we’ve collected a list of our competitor’s keywords and we’ve filtered out keywords that have metrics which are clearly too low to help us meet our goals. One key variable that we haven't looked at is SERP competition for our keywords. How difficult will it be to rank? Without understand this, we can't truly complete our 80/20 analysis. We want to find keywords that are not only profitable, but that will be relatively easy to rank for. The "sweet spot" will be high revenue potential keywords that require minimal effort to rank. ​I'm not sharing this as a shameless plug (ok, maybe a little...), but ​mainly because I think doing effective keyword research is way too much of a manual process at this point, and you probably do as well. At the moment I'm using a ﻿keyword tool ﻿I’m developing with Han to scrape keywords from multiple competitor sites, while simultaneously analyzing keyword competition in bulk. We're also building features to quickly analyze the profitability of a keyword, sort by opportunity, and to help you generate more related longtails. If you're interested, we'll be opening up a limited round of beta access in late January, and another limited round in mid-late February, just request access here. At this stage, you can use any keyword tool that has a “Keyword Difficulty” metric that you trust - ideally one that lets you do bulk competition checking (I've used TermExplorer with good results, though lately it does return some errors). If you don’t have access to any paid tools at the moment, you can sign up for a free trial at ﻿Moz﻿ and use their keyword difficulty tool (use the following link for an extended 90 day trial - not an affiliate link). However, its far from ideal for bulk analysis, since you can only check 20 keywords at a time and it doesn’t take into account on-page factors unless you run the more detailed SERP analysis. 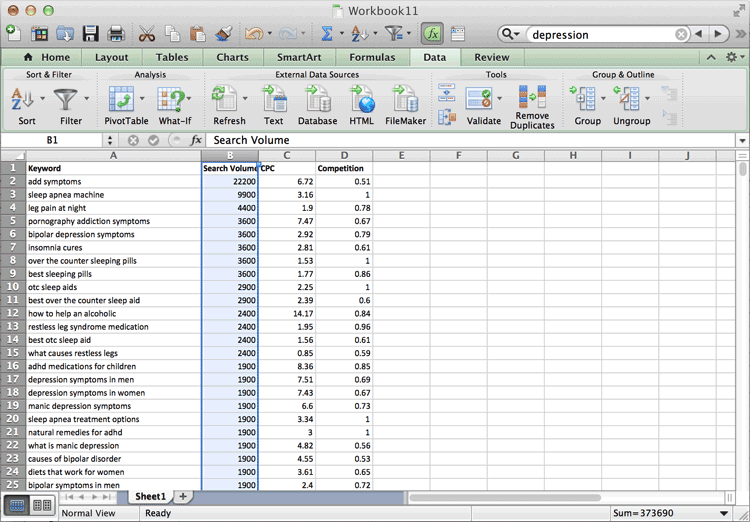 For the purposes of this guide, you can use the keyword difficulty from Moz since it has a free trial and is fairly popular, but I'll be using TermExplorer as an example since its publicly available, I still have a subscription, and its way better than the Moz tool for bulk analysis. By next week, we should be offering up limited beta access to AuthorityMetrics.com, which (in my totally biased opinion) will make the keyword research process I'm sharing here a whole lot easier. If you've learned the Thirst method through the NoHat internships, you can apply that as your prioritization method. If not, here's a quick way to prioritize your keywords, no matter which system you use to analyze keyword difficulty. As I mentioned, I've been working on a keyword tool that calculates these metrics automatically, but for now you can also do something similar with a spreadsheet. In your SEMRush keyword spreadsheet, add columns for each of these metrics. Keyword Difficulty - Use the metrics you pulled from your favorite keyword competition checker. Use the following formula if you're using Moz's Keyword Difficulty Tool or any tool that scores out of 100. : =(1000-(E2*10)). If you're using a tool like TermExplorer that scores out of 10, use this formula =(100-(E2*10)). Paste the formula into the first cell of the column, and drag the corner of the cell down to the last row. Note: The Opportunity metric isn’t an earnings projection, the goal here is simply to prioritize the highest opportunity keywords. You might note that this is exactly what the Thirst metric is designed to do - prioritize keywords with high potential. However, Thirst was tailored specifically for small niche sites powered by PBNs. If you don't fit that use case, you might want a more generally applicable metric to prioritize your keywords. I call this the "Opportunity" metric. Now, sort the entire sheet by Opportunity score, in descending order. (Instructions: Excel / Google Spreadsheets). 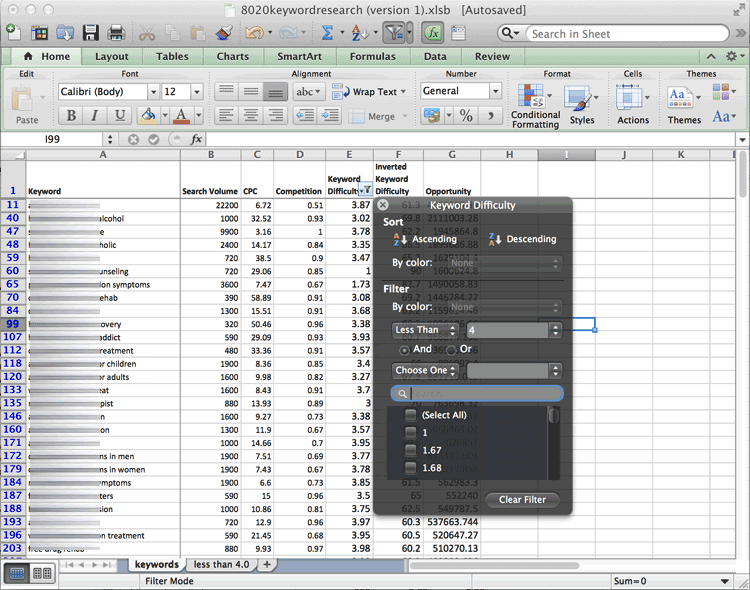 You should now have the highest Opportunity keywords at the top of your spreadsheet. But there is still one more step we need to take. Lastly, we want to filter the spreadsheet based on keyword difficulty, so we don't end up targeting overly competitive keywords. Use the “Filter” function on your spreadsheet (Excel / Google) to filter out any keywords that you don’t think you’ll be able to rank for early on. The threshold you set here will depend a bit on your linkbuilding ability, but generally under 40%, or even under 35% on the Moz difficulty tool is appropriate. If you're using TermExplorer, you might want to choose under 4 or under 3.5. Of course, you can set the threshold even lower if you want. If you're more confident in your linkbuilding ability, you have a powerful PBN, or you're applying this framework to find keywords for an existing site with age and authority, you can set the threshold higher. And there you go! The keywords with a nice balance of search volume, commercial value, and low keyword difficulty will be showing up, and all of them should be under your maximum keyword difficulty threshold. Now, go through the top results. Highlight the top 10-20 keywords that you think should go into separate articles, making sure you skip over and delete any irrelevant keywords you come across. E.g. If you have the keywords “keyword research software” and “best keyword research software”, you can just highlight "best keyword research software" since this will naturally target both keywords. Now we're going to group related keywords together. Go through your list and find other keywords related to the 10-20 keywords you highlighted and cut+paste those rows so they’re sitting under the related highlighted keywords. Finally, you want to dive deeper to find more longtails you can work into your content, you can use Google Keyword Planner or keywordtool.io to scrape a few other related longtails for each keyword group. Then go ahead and create content based on these keyword groups and launch your site. While you can do keyword research to maximize your chances of ranking for profitable keywords using minimal resources, its impossible to calculate anything in SEO with 100% certainty. The best solution for this is to make incremental investments into your SEO. Set up your site, optimize appropriately for your target keywords (being careful NOT to over-optimize), add content to your pages. The next step is to make small investments into ranking for those keywords, tracking those rankings carefully to see which ones show signs of traction, and focusing your resources on the keywords that start to gain traction. At the end of the day, Google's algorithm is a black box to everyone but a handful of high level engineers in Mountain View, California. As a result, a big part of SEO is observing the data, creating a hypothesis, gathering more data, then re-evaluating your hypothesis based on new data. If you have a PBN or you’re doing some form of forced linkbuilding, throw a minimal amount of links to each page so you can see how they react. If you’re more into whitehat linkbuilding (i.e. generating "earned" links) and you can’t just drip out links in bulk, focus on building awesome cornerstone articles for your most promising keywords and whatever linkbuilding tactics you prefer. Sprinkle in lots of internal links to other pages on your site, and monitor your rankings to see what else starts gaining traction as your domain authority starts to rise. Once you start to see what's gaining traction, focus your linkbuilding efforts on those pages and if necessary, focus on improving the content to make it easier to earn links. Look at other content that's ranking for the keyword or getting social shares and apply the Skyscraper Technique to figure out how you can make your content ﻿ever better and promote the content to the right sources﻿. Not only did you focus on the 20% of keyword groups that will likely create 80% of your output, in step 5/6 you are tracking your rankings and applying the 80/20 rule again to focus your SEO efforts only on the best performing 20%. By focusing your energy and resources into the right areas, you can generate exponential results with less input. One more big 80/20 productivity hack I've been working on is to automate the entire process described above. 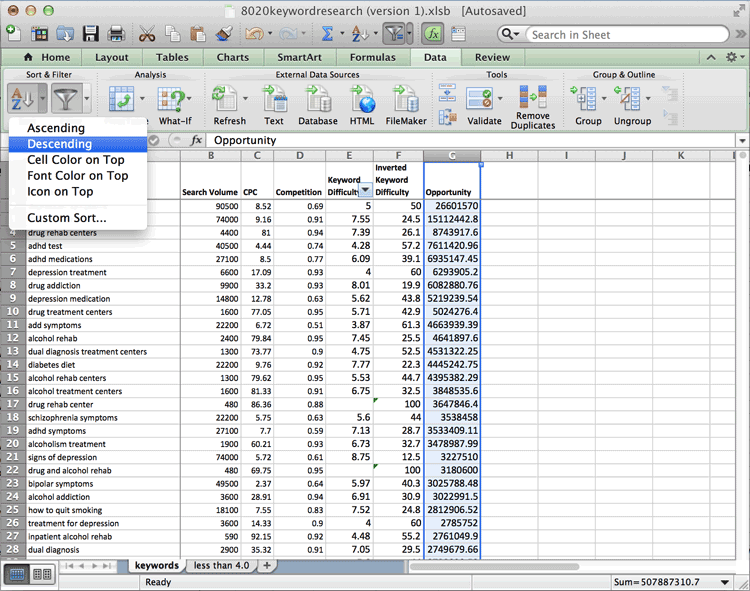 If you're doing the keyword research yourself, you don't get results spending time scraping your competitor's keywords, exporting them to spreadsheets, sorting and filtering them etc. The part that gives you a return on your time is the time you spend using your brain to understand the big picture. This means understanding SERP competition, understanding searcher intent, knowing how to build a user and Google-bot friendly site, creating valuable content, monetizing effectively, and putting the right processes and people in place to automate your workflow. By automating the tedious parts of the keyword research process, you can focus on analyzing the stuff that really matters. Han and I have been working on a tool to handle the most tedious processes in just a few clicks, and we're planning to start a limited beta release in late January. If you're interested, you can request access at AuthorityMetrics.com. Did you find this helpful? Drop me comment and let me know how the 80/20 will impact your next project. Really good write up, Nate! I’ve signed up for the beta. Sounds like a very good tool. Thanks for the support Loren. I hope we can live up to your expectations! another great post! I in the process of setting up a new site in the education niche and will try and apply these tactics to get me started. Good luck Chris, hope your new site does well. Great Post Nate. Definitely a lot of good points. First off – epic tutorial! Thanks for taking the time to put that all together. I love your analytical approach. I’ve been using a very similar equation for about the last year now to evaluate keyword revenue potential based on factors like search volume, CPC, and competition. It really is eye-opening how a seemingly good keyword may or may not be as profitable as other ones when you bundle all these factors together. Thanks. Yeah, its definitely useful to weigh the factors so that they more accurately reflect your goals – there are a lot of ways to slice the metrics in useful ways. Some people like to get even more analytical – Hayden has Thirst dialed into a science for niche sites + PBNs, and I know Nick Eubanks from seonick.net has a really in-depth approach that takes even more factors (e.g. linkbuilding costs, query type, highest attainable rank) into account that are especially valuable if you’re doing e-comm/agency work. Great article, I currently still use the thirst method for my affiliate sites using keywords gathered from Semrush. Another great Post. Definitely a lot of good points. Sure do Craig. Can reach me at greg ‘at’ nohatdigital.com. Last question . Do you guys usually go for post types in home page or static ? If static , what keywords are you targeting , the lowest competition in all or more like the main topic of keywords? There’s no one size fits all strategy here. Mine usually contain posts and possibly some customization to link to inner resources and make the site more user friendly. I don’t really go out of my way to target keywords on the homepage. Others like to create static pages and target some “main” keyword. If you are targeting a “main” keyword on your homepage, it should be something a little more ambitious and short tail than your inner pages are targeting, but still attainable.